(Clearwisdom.net) Dafa practitioner Qin Shizhen is 67 years old. She is a retired professor from Gansu Province. 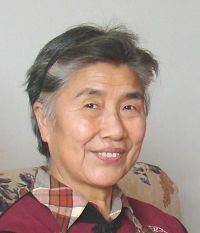 On May 24, 2008, she was taken by the police of the Lanzhou City Public Security Bureau to the Gongjiawan Brainwashing Center, also known as the "Lanzhou City Legal Training School." Her daughter, Li Hongyuan, has been unable to reach her since then. The Gongjiawan Brainwashing Center is located at 136 Gongjiapingbeilu, Qilihe District Lanzhou City in an old warehouse. Over the last six years, many Dafa practitioners were persecuted there to disability and death. Liu Zhifang a 48 year-old Pipa [a plucked string instrument with a fretted fingerboard] performer from Yujutuan was put in solitary confinement and tortured by being hung up; she died from persecution in July of 2005. Li Hongyuan wrote this to her mother during the Mid-Autumn Festival: "When the moon rises, hearts are connected at the remotest corners of the earth." When I took a nap earlier, I saw you quietly walk up to me and say: "Do not worry about me." Your smile was so bright and real. I woke up and only saw the deep and dark night outside. I still make my weekly phone call to you but I have not heard your voice for four months. I remember when I was young, when we spent our Mid-Autumn Festival sitting in the yard and enjoying the moon with fruits, snacks and moon cakes in the region of the Gobi Desert Dunhuang. You told us the story of Mogaoku, that mysterious sleeping Buddha, in the cave of a thousand Buddhas. The sincerity of our ancestors towards Buddha is witnessed by heaven and earth and I could never forget the story. I was in the seventh grade when we moved to Lanzhou City. I could not forget that Mid-Autumn Festival. Your health was failing but you still prepared all the goodies for us. Sitting there quietly watching us laughing and talking, you were just like that bright moon showering us with your love. Mother, when I was in high school, I once told my classmate that I admired you the most. You are sweet-natured, smart and elegant. I have been abroad for seven years now, and what I miss most is the time we spent back home. During our conversations while preparing for dinner, you could answer all my questions, trivial or profound. You taught me the virtue of being human. When I got up late, you told me: "A day's work starts at dawn, hardship makes people grow and mature." When friends helped me, you reminded me to repay the kindness. After I heard the story of a rock's flight of 10,000 li, I understood that although each and every one has his or her ambitions, it is best to have a clear conscience. You always tenderly protected us just like the lotus leaves that cover the lotus flower. You never complained even though you developed diabetic neuropathy. You rose early to prepare our breakfast and took good care of us when we stayed up late to do homework. Even now when you are held against your will, you still tell us not to worry. You have been looking for the true meaning of life all your life. Despite illness and difficulties, you were devoted to your family and society. When you discovered Falun Dafa, you realized that the true meaning of life is to return to the original self, and you became even more generous and open-minded. You let go of the attachment of a raise in salary, and became more considerate of the poor, even giving all you had to help them. Your illness disappeared, and looking at your bright smiling face, I was so happy for you. Because the Chinese Communist Party persecutes Falun Dafa, we cannot be together this Mid-Autumn Festival. Some relatives do not understand you. They ask: "Why don't you write a Guarantee Statement not to practice any more and get your freedom?" Mother, I understand you very well. Not only did our ancestors give a solemn promise that they would keep, but also Dafa practitioners who practice Truthfulness-Compassion-Forbearance. It is the people of today who have forgotten the basic principles of being human. The CCP cannot stand Truthfulness-Compassion-Forbearance, and have made a monstrous lie about the self-immolation on Tiananmen Square. It only exposed the extent of its evil and time will prove Dafa practitioners are the most precious and kind people in this world. I hope, Mother, that you have many righteous thoughts during this Mid-Autumn Festival.